Politics played a major role in this years NHL draft as the Rangers got what many considered to be the steal of the day when they selected a Russian forward at 17th overall. With the Rangers selecting late in the first round they were not expected to make an impact in what many considered a weak draft. That all changed when they selected forward Alexi Cherepanov with their first pick. Cherepanov was expected to go anywhere between 5th and 10th overall but slid all the way down to 17th when fears that his Russian team would not release him to play in America. Many teams, not wanting to waste a top pick, passed up the opportunity to get the top-rated European in the draft. Not only do the Rangers feel confident that Cherepanov will be released from his team, the Daily News has reported that a deal may already be in place. “In this case, we have an agreement with the club (Omsk) and Alexi has an agreement with the club that they will allow him to come over here after the season,” said agent Jay Grossman. The 18-year-old notched 18 goals and 11 assists in 46 games for Omsk this past season. The 18 goal mark is a league rookie record eclipsing the likes of Alex Ovechkin, Ilya Kovalchuk, and Evgeni Malkin. With the Rangers second pick in the draft, they selected Canadian goalie Antoine Lafleur. This move is significant because it comes on the same week that Vezina trophy finalist Henrik Lundqvist expressed his interest in staying in New York. Lundqvist is looking for a long-term deal in the $5 million range which will keep him between the pipes at the garden for years to come. With King Henrik pledging allegiance to his team and the 2nd round selection of Lafleur it looks like the Rangers will make former first-round pick Al Montoya available. The Rangers will also resume talks with center Michael Nylander this week. The two sides have not talked since the Rangers offered him a three-year $11.25 million offer. The Olympic gold medal-winning pivot has since changed agents, a sign that he is interested in more money. It is rumored that Nylander will command up to $20 million for a 4 year contract in the open market. Brendan Shanahan has said he has chosen to pass up retirement and play another season in the NHL. 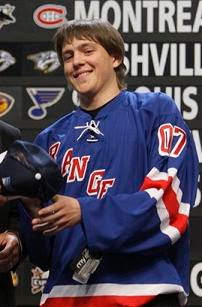 This is good news for Ranger fans as he stated that he has no interest in becoming a free agent. “I'm going to play next year and it is my intention to play for the Rangers,” Shanahan told the NY Post. Shanahan certainly still has the ability to play at a top level, but still harbors concerns about giving it another shot. Suffering a concussion on Feb. 17 after colliding with the Flyer's Mike Knuble caused him to miss 15 games. After recovering from the injury, the veteran leader went on to play in 9 more games registering 8 points. He also played in 10 playoff games scoring 5 goals with 2 assists. Jed Ortmeyer's agent Mark Witkin has said his team has made no progess towards bringing Ortmeyer back to New York for the 07-08 season. It looks like the tenacious penalty killer could be moving on.